Of course, many archaeologists and classicists cannot resist this years Athens Olympics – pressed into service, celebration and self promotion. The New York Times ran an article on March 9 under the title When the games began: Olympic archaeology. Richard Martin put me onto it. The International Herald Tribune ran the same yesterday as Olympics: games return to ancient roots. The exuberance and pageantry of the original Greek games – even the spirit of community among rivals, however fleeting – will be re-enacted in August at the next Olympic Games in Athens, in the land where it all began. In athletics, scholars argue, the Greeks expressed one of their defining attributes: the pursuit of excellence through public competition. The games were festivals of the Greekness that reverberates at the core of Western culture. Donald G. Kyle, a professor of ancient history at the University of Texas in Arlington, said that long before the Greeks, others engaged in competitive sports like running and boxing. Contemporaries of the Greeks in Egypt and Mesopotamia put on lavish entertainments at court, with acrobats and athletes performing, and also promoted some sports as part of military training. Kyle is writing a book on sport and spectacle in the ancient world. At Nemea, where he has excavated since 1973, Miller said he discovered what he feels sure was the stadium’s locker room, the earliest known inner sanctum of athletes. Fans of the modern Olympics would find striking differences at the original games. There were no team sports and no second-place prizes. Fouls were punished by flogging; vase paintings show judges with switches. The athletes, though considered amateurs, were allowed to accept cash and valuable gifts before and after competing. Women were prohibited from watching or taking part, except as owners in horse races. In later years, separate contests were staged for women in honor of Hera, the wife of Zeus. Jenifer Neils, an art historian at Case Western Reserve University, said that unmarried girls ran a race wearing the Greek equivalent of a gym tunic that left the right breast bare – a foreshadowing, perhaps, of Janet Jackson’s Super Bowl stunt, she suggested. What do they want? The past mirroring the present, justifying and accrediting – that’s what. They consider the ancient Greek achievement wonderful (contrast the despotic orientals who kept sport from the masses – though the Greek games were for an aristocratic elite). And they claim it now, writing their books and running their excavations. Locker rooms then and now. 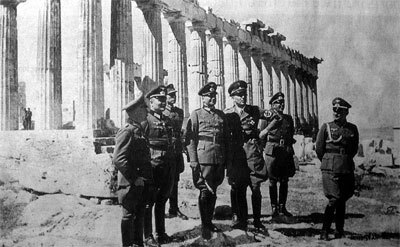 The Greek state desparately wants the connection – the nationalist claim to the legacy of classical Greece. It always has. It was founded in the 1830s on this basis and remembers. The past selectively taken up to promote something we like today – the Greek state, competitive sport, our excavations, whatever. Let’s remember that the German excavations were reopened at Olympia to prepare the way for the Nazi Berlin Olympics in 1936. Leni Riefenstahl made a wonderful and revolutionary documentary about the games – celebrating the fascist body (Susan Sontag got it right). Hitler’s favorite sculpture was the discoboulos. Aryan identity looked to Greek roots. 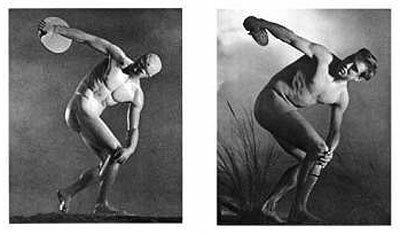 On sport – ancient “sports” are about a reconfiguring of the male body that starts in the early bronze age with the invention of the warrior hero. This was recruited as a crucial component of the new body politic of elite male citizen members of the Greek city state in the 700s BCE. Yes – a fundamental part of the ancient Greek state. (I am writing about this in my latest book – but see also my extensive treatment in Art and the Early Greek State, Cambridge 1999). But let’s not be naive, there is no continuity with modern sport to speak of, other than a conscious and superficial mimicry concocted by nineteenth century ideologists. Why can’t we revel in the wonder of the past, in all its human contradiction, without this propaganda?